ve had extensive tooth damage or those who need a tooth replaced, dental implants can be life changing. Though the procedures involve some time for examination, prep, minor surgery and healing, getting dental implants can greatly improve the appearance and health of your teeth and jaws. The periodontics and implantology specialist at our central Florida office will make a recommendation regarding a dental implant procedure after examining your teeth, gums, and jaw. This includes examination of the bone and gum health as well as screening for conditions such as osteoporosis. He or she will need to assess whether you have the proper baseline bone health before proceeding. If you do not, bone grafting may be done to provide the proper amount of bone necessary for implantation. Bone grafting may be done immediately after the extraction of a tooth, during implantation, or several months prior. Gum health is important too. If gums are not in good health, this could mean the implants could fail or become infected during the healing. Make sure to take care of any issues with periodontal disease (gum disease) prior to starting the process for dental implants if applicable. This can be treated by a periodontist. Next, you will need to have the damaged tooth removed. The jawbone will be prepped for surgery, which may or may not include bone grafting, depending on the situation of the patient. When the jawbone heals, a metal post is placed in the jawbone. There is another healing period that could last several months. The last stage is placing the abutment, then the crown. Bone grafting, as previously noted, is not always required. In the case that it is, bone may be taken from another part of your jaw or from another part of your body such as your hip and transplanted to the jaw. This will help build support for the implant. The surgeon will make a small opening in the gum to insert a post, which basically serves as the root of the tooth. A temporary partial may be placed where the tooth was removed for better appearance, since there will be a gap. This can be removed for cleaning at night while you sleep. 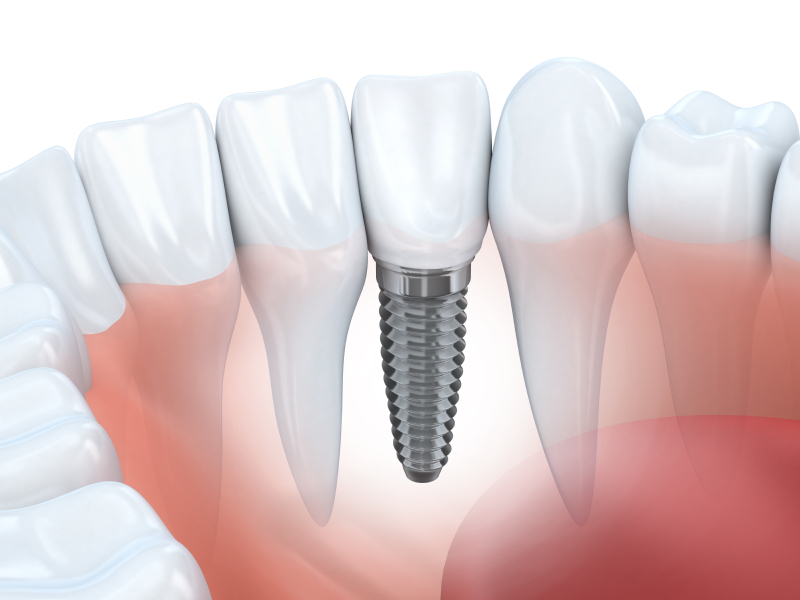 ll need another minor surgery to place an abutment that is attached to the dental implant. This is the piece that the crown will be attached to. an order of operations if you will. There are a few healing stages as well, but after the healing process is complete, you are able to choose an artificial tooth, or teeth. There are removable implants and fixed implants. Removable implants may be taken out for cleaning, whereas fixed implants stay in your mouth and cannot be taken out. Consult with Central Florida Periodontics to see what your options are.